One year ago today, Dunfermline travelled a long distance to take on an on form second division team in the CIS league cup. They struggled and for long periods of play were outplayed by the lower league team (granted they were at least full timers last year) A goalkeeping performance kept The Pars in the trophy a year ago, though with a different man between the sticks. Four changes were made to the starting line up that took a point from Tannadice on Saturday. Dorus De Vries came in for his full Dunfermline debut in goals, replacing Roddy McKenzie. Sol Bamba, Scott Wilson and Phil McGuire again continued as a back three, looking to continue their recent solid defensive line up. Jamie McCunnie reverted back to his role that caused so much grief last season at right wing back, whilst Callum Woods was on the opposite side. The midfield saw a return from injury for Darren Young who started his first game of the season. Greg Ross also started his first game of the season after an injury lay off. Gary Mason continued alongside them both after a slow start to his season. 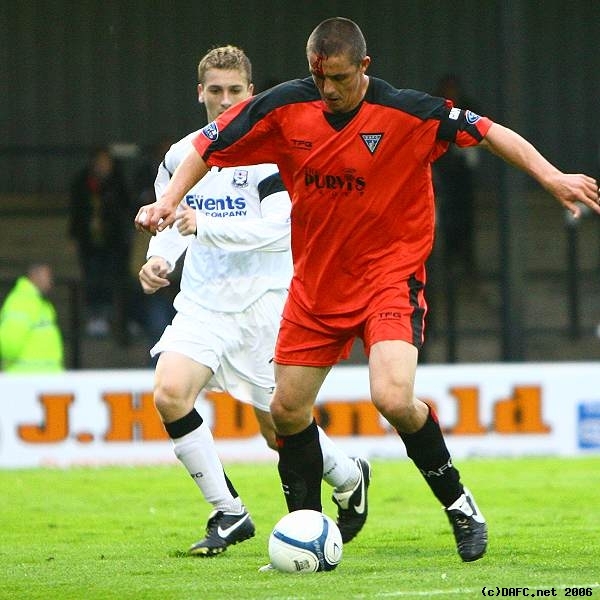 With Mark Burchill once again joining the casualty list, Andy Tod and Owen Morrison were the new front pairing charged with the task of breaking Ayr United down. There was genuinely little to report from the opening 45 minutes. The Pars fans who spread across the terracing, some seeking cover from the rain behind the goals, whilst others braved it out nearer the burger van which provided the only highlights of the first half. I’d recommend the steak pies, but alas I bought the last one much to the annoyance of the poor chap behind me in the queue……. The second half kicked off and Dunfermline suddenly seemed to discover some urgency about their play, testing McGeown on a couple of occasions in the Ayr goal. A Phil McGuire drive was sent just wide of the post and Andy Tod had an effort blocked in a rare moment of excitement for the supporters. Jamie McCunnie. Ayr Utd. 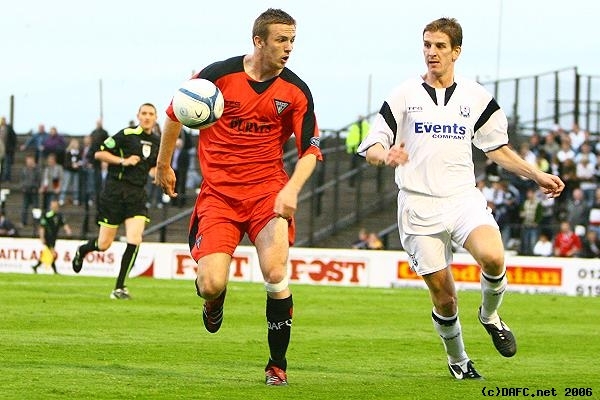 v Pars 22nd August 2006. As time wore on increasingly slowly, it became apparent that there was going to be little between the teams. This punter’s bet of there being less than 1.5 goals during the 90 minutes was looking as safe as houses. Substitutions were made on a rapid basis by both managers as they tried in vain to inject some life into the proceedings. Callum Smith came on to become another Dunfermline debutant, whilst Craig Wilson replaced the ineffective Greg Ross in midfield. De Vries had a major scare when he punched the ball clear, when really there was no need to and a catch would have sufficed. Strain had the relatively simple task of simply placing the ball in the net, but he went for power and the open goal was not troubled as his shot skimmed off the crossbar. Gareth Wardlaw, returning from injury for Ayr, came off the bench and immediately started causing a few more problems for the defence, which up until that point had never looked like being breached. With just four minutes of the ninety remaining, Bamba committed a clear foul on Wardlaw and a penalty was awarded to Ayr. With their fans in raptures behind De Vries’ goal, the Dutchman had the last laugh as he dived low to his left to save Caddis’ penalty with relative ease. Caddis had the one outstanding chance in the match for either team to win the tie, but really fluffed his kick and showed no determination to burst the net. De Vries enjoyed his moment though and the advantage suddenly swung Dunfermline`s way. The referee, Craig Thomson, blew for full time to a chorus of boos and Pars players fell to the ground, remarkably, through tiredness setting in. Whilst Ayr continued to play with a spring in their step, Dunfermline looked sluggish throughout extra time and there can be no excuses for that. Dunfermline forced five throw ins in the dying minutes near the Ayr bye line, however all five were feeble attempts to aim the ball for Andy Tod’s head and hope for the best. Frustrating to say the least! Thankfully, the referee finally blew for full time after 120 minutes of dire footballing fayre. A penalty shoot out resulted, with the referee taking the competition to the home end in front of their gathered, and by now very expectant, supporters. 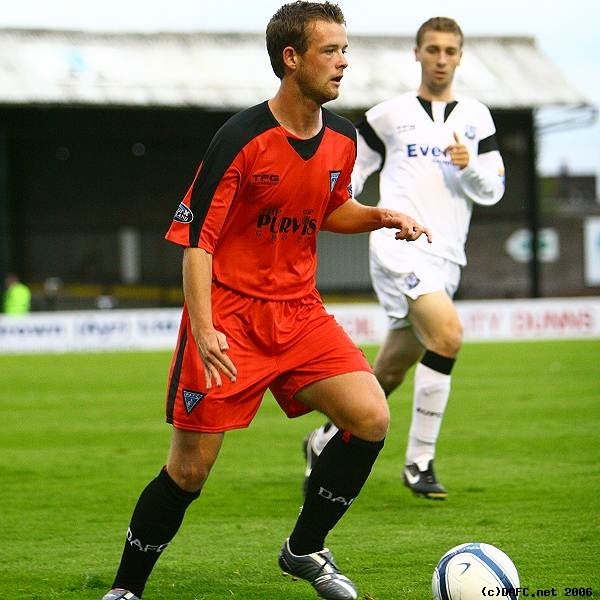 The experienced penalty takers kicked off, with Veraille scoring for Ayr and Darren Young equilising for Dunfermline. Weaver then missed for Ayr, however Callum Woods’ shot was saved, still 1-1 after two kicks each!